Note: Also available as an audio reading. Followed several years later by a much more in-depth and frank autobiography Still Getting Away With It. 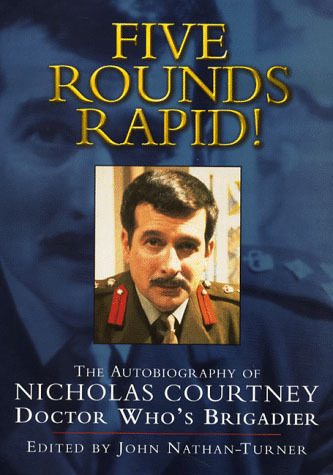 After a relatively unhappy childhood and education, and a fascinating apprenticeship in repertory theatre, Nicholas Courtney moved into television in the sixties. An early audition for a part in the BBC's Doctor Who — which he didn't get — led to an association with the show in 1965 that is still going strong. The Brigadier is one of Doctor Who's best-loved characters — a humorous amalgam of British reserve, dogged loyalty to the Queen, country (and Doctor) and a nice line in deadpan wit — a tribute to those in the armed forces who face adversity with bravery, a stiff upper lip, yet an active sense of humour. Five Rounds Rapid! recounts the ups and downs, the setbacks, religion, remorse, triumph, divorce, recognition, unhappiness, new-found joy, loss and professional accolades throughout the world as Nick treads the boards of life with tremendous optimism. Despite being typecast as a military type by many, his extensive career includes Shakespeare with Sir Donald Wolfit, farce with Eric Sykes, pantomime with Wilfrid Brambell, hugely successful nationwide tours, musicals and some of the best-loved sitcoms and lauded dramas on television. Despite his busy schedule, Nick has still found time to hold a position of great authority on the Equity council for many years, and to appear on stage in PVC, fishnets and high heels. But Doctor Who is clearly the favourite part of his career and here he charts his feelings about every story in which he appeared in the longest-running sci-fi series in the world — with great fondness, honesty and humour. After all, no other actor has appeared in the programme with William Hartnell, Patrick Troughton, Jon Pertwee, Tom Baker, Peter Davison, Richard Hurndall, Colin Baker and Sylvester McCoy. His anecdotes are amusing, riveting and often surprising. Five Rounds Rapid! is lavishly illustrated with over a hundred photographs — many from Nick's own collection and published here for the first time — and reveals that Nick is truly 'a soldier in Time'.